We had an opportunity to meet Prof. Haruo Nishino, leading scholar in the world of modern Noh studies. Because of his distinguished achievements and fame, we had been feeling a bit humble and diffident before meeting him, however, once we met, we found him very friendly and open. As he started talking about Noh with the bright eyes typical of a young boy, his talk based on his extensive knowledge was like an inexhaustible spring. We also heard his strict and uncompromising warning to the current Noh community. However, every word of his speech made us aware of the love of a man who met the profound art of Noh, and heartful encouragement to the performers. The current Noh community is apparently pleased by its prosperity, but I think it's at a crucial moment. Except those who are thoughtful, performers, scholars and journalists pay attention to the superficial outcomes without understanding the essential values of the art. Some performances have excessive stage effects, and some schools even open their dressing rooms to the public; there are too many such explanatory activities. Essentially, unexpressed, hidden elements make the expressions of Noh vivid. I think some contemporary performers cannot draw a hard line between what should be hidden and what should be disclosed. I can't overlook the trend of explaining everything under a good name of "enlightenment." The subtitle system is also in much request, but it could hurt the image of Noh if it's used improperly. Overseas performances were once full of spirit and of high quality, but are now at the turning point. I cannot say they should never been held, but it seems there are many performers inadequate to represent the Japanese Noh community who go abroad under the name of spreading Noh. Although courage is necessary, because of their deeds, we could find ourselves in a serious situation. The prevalence of takigi-noh (outdoor Noh performances by the light of bonfires) has a role in the prosperous Noh boom, but too many programs would become a problem for the community. takigi-noh are mainly held in summer, but that is originally the period of airing masks and costumes, and also for the performers to relax for the peak season in autumn. The number has recently fallen and the boom has somewhat calmed down, I suppose. Of course I'm not negative toward all of the outdoor Noh performances. When dusk deepens, the moon appears in the sky. We can come across some indescribable excellent productions rich in atmosphere. However, I'd ask for a thoughtful choice of pieces and presentations suitable for outdoor performances, without taking the easy way out in selecting pieces or presentations. If you watch a Noh play for the first time, I would like you to enjoy yourself without a preconceived idea. A Noh play is a kind of a long verse. You should not try to understand it. You should feel it and enjoy yourself by listening to the sound and feeling the rhythm of the words and the musical accompaniment. But you can't enjoy yourself by watching them without any knowledge, so I'd recommend you check the synopsis, or look through the text before watching. But take it easy. Too much research will make you tired. The late Kanze Tetsunojō VIII (Shizuo) once told me that Noh was a fusion of an accelerator and a brake. I completely agree with him. The unique expressions of Noh are generated from the unusual, impossible situation in which the performer steps on the accelerator and the brake at the same time. I think it's true for all acting, chanting, and music. I'd say it's "a double expression," or "a dual structure." Two opposing things, such as "strength and weakness," or "youth and agedness" sublate (or aufheben) and merge into a new beauty. You'll find it true when you see actual performances. In "Fūshikaden," Zeami said "When you describe a strong figure, you should have a gentle mind, and when you describe a gentle figure, you should have a strong mind." One of the latest subjects of my study is the Noh mask. As the fruit of my effort, the Institute published a book in May 2007. 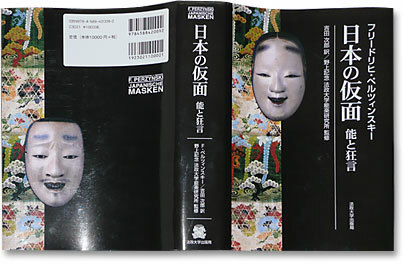 It's titled "Japanische Masken: No und Kyogen (Japanese Masks: Noh and Kyōgen)" (Friedrich Perzynsky, Jirō Yoshida (trans. ), Nogami Memorial Institute for Noh Studies, Hosei University (ed. ), Hosei University Press). Friedrich Perzynsky was a German oriental art historian born in the 19th Century. He originally published the book in 1924 (Taisho 13). It was the first great achievement of the close study of Noh masks, both systematic and comprehensive, which had not been accomplished by any Japanese scholars. In the opening sentences, Perzynsky wrote "The history of the art of Japanese mask making should have been written by a Japanese scholar." Nogami Toyoichirō, who was the pioneer of the Noh study, devoted himself to the study of Noh masks after being inspired by the original German version. I have also been struggling to find a way to publish the Japanese version since I discovered Perzynsky's great work. During the preparatory period, I found the Japanese translation by Prof. Jirō Yoshida, Honorary Professor of Kyoto University, and came across Perzynsky's correspondence. One of the members of the Institute, Ms. Yamanaka has led the revision of the translation and the addition of annotations, and other young members have helped us to add an index. Thanks to such help by both domestic and foreign fellows, we managed to publish the Japanese version. They say, "Where there's a will, there's a way." This was a true example of the proverb. I've developed relationships with many scholars from various countries. My experiences included a year in London and Paris from the spring of 1996, as well as the attendance at academic conferences and the involvement in research in foreign countries. Foreign people watch Noh plays without any bias, and sometimes discover what we cannot even notice. So I'm very much stimulated. I've also been inspired by friendly communications with the foreign scholars who consider humour and spirit important. I was once given the welcome name of "the Evangelist of Noh" by a young Italian student. I'd like to perform the duties of an evangelist, and allow foreign people to enjoy Noh performances and videos that are full of genuine essence of Noh. When I entered Hosei University, I didn't even know the Institute for Noh Studies existed. My Noh study started when I entered the seminar of Prof. Akira Omote (Honorary Professor of Hosei University), in which I was imbued with the way to interpret documentation. He was the father of my studies. When I went on to the master's course, I was taught the practical techniques of Noh by Prof. Mario Yokomichi (Former Professor of Tokyo National University of Fine Arts and Music). He is the greatest genius of the century, fully acquainted with the techniques of every Noh school, and has laid the foundation of the study of Noh techniques. I'd had no knowledge of the practical techniques before, but thanks to the coaching at the Noh Technique Society (the so-called "Yokomichi School"), I was able to acquire a general knowledge of the technique and the theory. Prof. Yokomichi has given me moral support. When I was in the doctor's course, I served as an assistant to the late Kanze Hisao in writing a book, and I studied intensely. I fully realize how fortunate I have been to meet those predecessors and to take lessons. One of the bases for me to go into Noh studies may be the experience to see hakajishi, which is a unique traditional kagura (sacred music and dancing) in my birthplace, Samemachi in Hachinohe, Aomori. The music is distinguished by its mournful melody followed by the modulation into a major key. I think growing up with the music may have led me to my present career. There is another episode in the study of Noh masks. I've found a yamanba mask particularly different from ordinary ones in Italy. After the discovery, I've researched it and concluded that it was used in a discarded piece "Yukioni"*, and the character Yukioni was merged by another female character yamanba. Then I wrote an essay of this assumption and presented it. Though there isn't sufficient evidence I've finally jumped to that conclusion. Prof. Yokomichi says, "Because every research has some risks of misunderstanding, scholars must have an insight into the subject to overcome the risks." Materials are certainly important. We could stop at the point as far as the materials can prove. But I'd like to keep a good heart to make a leap forward. I might twist my ankle when I fail to vault, though. (*) Through the good offices of Prof. Nishino who wrote the script, "Yukioni" was revived in 1993 (Heisei 5) among the study programmes at the National Noh Theatre, with Kagawa Seiji of the Kita school in the leading part. Another of my duties is to lead students and give encouragement to performers. But that doesn't mean indulging them. Noh possesses expressions of its own, and it has the honor of being a part of modern dramas even though it's classical. I do not think it becomes outdated, nor would I want it to be. Because of my expectations, I've been hard on the performers. I think we should consider Zeami's opinions and spirits on the art as a guide. Mr. Kanze Hisao also searched for the profound essence of Noh in the foundation of Zeami's achievements. Whether we can hand down the authentic Noh really devolves on the performers of our own time. I want them to face their duties with ambition. 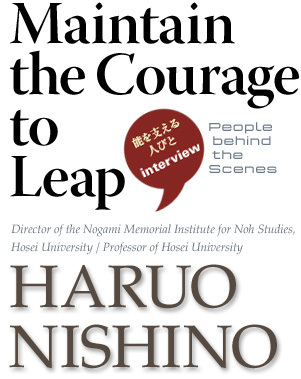 Prof. Haruo Nishino was born in Aomori in 1943 (Shōwa 18). 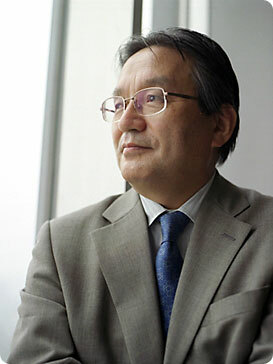 He is the director of the Nogami Memorial Institute for Noh Studies and a professor of literature at Hosei University. He specializes in Noh studies and medieval Japanese literature. 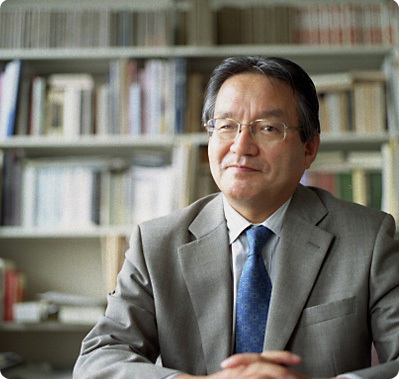 He is a leading scholar of Noh studies, and has been producing considerable achievements in his comprehensive research on Noh. He is extremely active in various subjects, devoting himself to interpretation and revival of neglected pieces and new productions.